In music circles the 3rd of February 1959 will always be remembered as “The Day the Music Died” with the tragic death in an aircraft crash of Buddy Holly (That’ll be the Day), Ritchie Valens (La Bamba), “The Big Bopper” Richardson (Chantilly Lace) and their pilot Roger Peterson. In conservation circles what date will we remember as “The Day Logic Died”. Towards the end of the 19th Century the Southern White Rhino was considered extinct. This extinction was caused not only through uncontrolled sport hunting but also from hunting for tsetse fly eradication. In 1894 Sir Henry McCullum shot two Black Rhino near the confluence of the Black and White Umfolozi Rivers. These two Black Rhino were in fact not Black Rhino but the “extinct” Southern White Rhino. The estimated size of this small population varied from as low as 20 Rhino to around about 100 Rhino. Regardless of the size of the population we were given a second chance. The discovery of this small population led to the founding of the Hluhluwe-Imfolozi Game Reserve in 1895, the oldest game reserves in Africa. In 1953, by means of aerial counts the late Dr. Ian Player estimated that there were 437 Rhino in the Hluhluwe-Imfolozi Game Reserve. As this population was increasing it became evident that the Rhino had exceeded their carrying capacity. Dr. Player together with the then Natal Parks Board initiated the first legal Rhino trade with a project called “Operation Rhino”. Operation Rhino was to translocate the then Critically Endangered White Rhino to other reserves, first within the then province of Natal and then into the rest of South Africa. Soon South Africa’s reserves had all been restocked and the Southern White Rhino were made available to other reserves within Africa as well as sold to zoos and wildlife parks throughout the world to establish breeding populations outside the country. As the population was still growing the Natal Parks Board considered culling the excess Rhino. Dr. Player disagreed with this wildlife management practice as he felt there was still a market for White Rhino. He made the proposal, which was accepted by the Board, to make these excess White Rhinos available to trophy hunters. Through Operation Rhino the critically endangered White Rhino clawed its way back from extinction to a healthy sustainable population. These are just some of the people that made Operation Rhino such a success and we will always be indebted to them – Ian Player, Toni Harthoorn, George Hughes, David Cook, Magquebu Ntombela, Colonel Vincent, Paul Dutton, John Clark, Nick Steel, Kenrow Sharr and Jim Feely. Operation Rhino and the legal trade which Dr. Player had initiated was such a success that both Dr. Ian Player and the then Natal Parks Board were praised for their vision, foresight and their conservation effort. Southern White Rhino numbers increased from a floundering 437 Rhino in 1953 to over 20 000 White Rhino today. The IUCN African Rhino Specialist Group in 2016 estimated that there are between 19,682 – 21,077 White Rhinos. In 1977 CITES banned the international trade in Rhino horn. 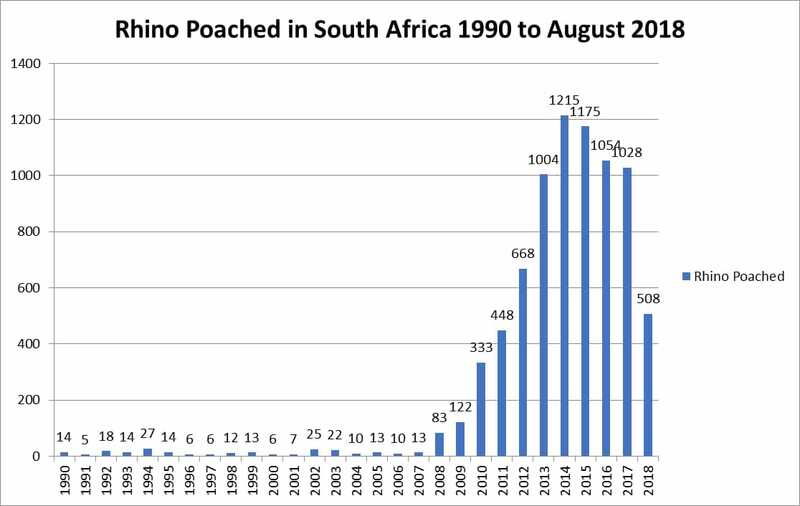 This ban did not seem to have much effect on the world-wide Rhino population as their numbers were still on the decline except for Southern African countries and South Africa in particular where their numbers were still on the increase with a very small amount of rhino being poached. South Africa success was due to the local legal trade in horn, trophy hunting and a live trade in Rhino as initiated by Dr. Player and the Natal Parks Board. A few years ago, poaching of Rhino in South Africa was unheard of. UNTIL 2009/2010. Before long poaching was a daily news item with at least one rhino poached per day. Before long this had increased to three rhino being poached daily. This surge in poaching became big business with anti-poaching teams being trained, kitted out and employed, as well as all sorts of other mitigating measures were being employed to protect rhino and the inevitable birth of a new cause – “Save the Rhino”. Millions of US $ have and are being donated worldwide to old established “conservation organizations”, every animal rights movement on the planet cashing in and unashamedly exploiting the Rhinos fate as well as a mushrooming of new “conservation organizations” jumping on the bandwagon. I suspect the Billions that have been raised to save this iconic charismatic megafauna could have gone a long way to buying a very large chunk of Africa – sadly this hasn’t been the case, though I’m sure salary packages, luxury car manufacturers, airlines, luxury hotels and conference venues and a whole host of other non-Rhino related industry has benefited from the cash going around. A few months ago, I ask myself what brought about this sudden explosion of poaching in South Africa. I went back year by year looking at the numbers. I was surprised to find graph after graph on Rhino numbers all leading back to a spike in poaching which started in late 2008 early 2009. In 2007/2008 (possibly prior to this) certain “conservation” organizations were concerned about South Africa’s legal trade in sustainable Rhino horn as they felt this could potentially lead to an increase in poaching. They started applying pressure on the South African wildlife scientists employed by the Department of Environmental Affairs (DEA) to ban the local trade in Rhino horn. In 2008 a draft policy banning the local trade was published for public comment by DEA. With the cat out the bag and the pending ban on the horizon there was an immediate escalation in poaching from 13 rhino poached in 2007 to 83 rhino poached in 2008, an increase of 538 %. And it’s only going to get worse. The ban came into effect February 2009. In the past decade (2008 – 2017) South Africa has had 7130 Rhino murdered for their horn. In the decade prior to this (1998 – 2007) a total of 131 Rhino were poached. Since the introduction of the local ban this has been an increase of 7000%. Pre-ban we had an average of 13.1 Rhino poached per year – just over one Rhino per month. After the ban that average has skyrocketed by 5443% to an average of 713 Rhino poached per year – just short of 2 A DAY.